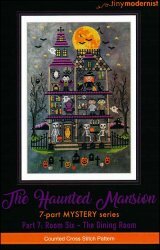 The Haunted Mansion Part 7: Room Six - The Dining Room [C1062] - $2.00 : Yarn Tree, Your wholesale source for cross stitch supplies. Cross stitch pattern from Tiny Modernist. Make no bones about it, these two skeletons are having quite the meal tonight with skeleton ribs & spider cider. Welcome to the dining room, where the candelabra shines bright, spider webs hang from the ceiling & a crow stands in the corner. Welcome to "The Haunted Mansion." Stitch count is 156W x 224H for the full design.